Looking at UK pay TV revenues, it would appear the broadcast television industry is okay. According to Ofcom Technology Tracker, 2016 revenues rose 1.0% in real terms. Interestingly, this increase was driven by a 2.8% increase pay-TV subscriptions revenues, despite the average household spend on television services staying fairly flat since 2014. So, what’s driving this revenue rise? Primarily it’s the viewers’ increasing freedom to break from schedules once imposed by broadcasters. Viewers are quickly taking to the huge range of devices and services that let them watch what, when and where they want. Ofcom’s 2017 research shows the growing tendency for people to view content away from home. Over a third surveyed (37%) stated they watch content on a device outside their home, including while on holiday, commuting and even in their local pub or restaurant. Younger viewers are leading this change, with 58% watching content away from home. Growth in alternative viewing devices means the use of traditional televisions and DVD players is declining. Smart TVs are the consumer choice, with internet connectivity allowing access to on-demand content and streaming services from apps such as BBC iPlayer and ITV Hub. In 2017, over a third of UK households had a smart TV and 10% had a set-top box supporting digital services, including subscription TV and gaming. Other threats to revenue include teens viewing on YouTube (66% in 2017 per Ofcom) and illegal streaming of content. 2017 YouGove research estimates that about 5 million people in the UK were using pirated streaming services to watch everything from top sports events to the latest movies €”all for free. As people increasingly move from traditional broadcaster offerings, the industry must find ways to generate new revenue. An answer has been to increase subscription fees or add advertising €”both cited as primary reasons viewers are moving away in the first place. Ofcom’s research shows people are actively choosing to avoid adverts. About 7 in 10 people choose to watch TV on demand, primarily so they don’t have to sit through ad breaks. Even if they continue watching, viewers now have other options to fill the breaks; for example younger viewers switch to other devices. While ad revenues may be falling, an opportunity comes from people’s willingness to pay something to avoid ads. While consumers are gaining power in the viewer/broadcaster relationship, broadcasting’s future isn’t all doom and gloom. Viewers’ changing habits open a plethora of opportunities; technology itself is allowing the watch “what, when and where” phenomenon. Beyond keeping pace, sometimes technology is even leading change, and allowing providers to react instantly to viewers’ preferences. Live broadcast TV remains most viewers’ chosen source for news and for watching big events, such as sports and music. Interestingly, it’s also the source for their “background noise.” To keep ahead of options competing for viewers’ attention, broadcasters must use every means possible to get to breaking news first and to provide enhanced live coverage throughout an event. Until now, a satellite truck, production equipment and a host of skilled people were needed to broadcast live events. Connectivity and speed limitations meant the final produced programme needed to be done at the event location before being broadcast to the world. But that’s changing with technological innovations such as wireless transmission over multiple global 4G cellular networks and ultra-low latency delivery over fibre. Now, if you want to showcase a live event far from your home base, affordable technology makes it easier, with less equipment and fewer people needed onsite. Over 90% of adults will have a smart phone by 2023 (Deloitte). It’s certainly the device most feel is a necessity, with lines blurring between its use for work, entertainment and social connection. Who’s driving this change? Not younger users; actually those in older age groups are having the biggest impact as they adopt the technology. The arrival of Gigabit-per-second connectivity speeds, faster processing power, and artificial intelligence, and the emergence of augmented reality means the potential for as yet undiscovered content and consumption. Broadcasters want to meet viewer demands in ways that don’t increase costs or that improve quality to the point that more viewers watch and therefore revenues increase. HEVC the latest high-compression format is being pushed to the forefront of technology as it’s increasingly adopted by iOS and Android portable devices, as well as on broadcaster set-top boxes for premium 4K UHD delivery. Many viewers say they prefer to watch sports on TV because they miss too much when at an actual event venue. But when watching a live streamed event, they’re worried it will lag and buffer, and about a third expect poor picture quality. Solutions are emerging that drive viewer engagement by providing high-quality video with less than a half second of end-to-end latency to almost any device. The result: millions of concurrent users can experience the same event streamed live without adding any discernible delay and without the annoyance of the action being heard multiple times across different devices as the game unfolds. With the Internet of Things, it’s now possible to collect data from every part of your workflow. This lets you quickly fix issues that may cause viewers to turn to other options. Software and technology also let you track data about when, where and how content is being viewed. It’s possible to allow viewer interaction during a live event that provides feedback for immediate use to improve viewer experience or for future programming. The information can even be used to target customers by recommending behavior-based content. While broadcasters still receiving significant portions of their revenue from advertising won’t drop it all instantly, ad formats and load need to be viewer appropriate. Technology is making it possible to target advertising down to the individual, based on stated interests or viewing habits. With evolving transmission technologies and viewing devices, soon a programme on TV may show different adverts than the one on a tablet. Fan bases for entertainment and sports teams can quickly and easily go global giving content providers opportunities to view their markets differently and provide added advantage. For example, fragmenting content agreements will be done more often. For sports rights holders, rights will be split among multiple providers, and premium sports rights are being split across the traditional subscription TV platform operators as well as online and OTT operators. In the UK, viewers from 2019 will need to subscribe to three separate subscription platforms to watch every Premier League game delivered live. It’s important to not lose sight of the present as we prepare for the future. Despite many technological changes, traditional live broadcast TV still dominates viewers’ choices. According to Ofcom, around 50% of people in the UK simply switch on the TV to see what’s going to be airing that night. Teens see live TV as the service they’re most likely to use for family time. Pay-TV operators, including Sky, Virgin Media, BT TV and TalkTalk TV, account for 46% of industry revenue. Viewers see on-demand and streaming services as complementary to their pay-TV subscription, with about three-quarters of on-demand and streaming subscribers also having a pay-TV subscription (Ofcom 2016). No matter how inexpensive or ad-free the content, viewers won’t watch for long if they’re not satisfied with it. Increasingly, content needs to expand their experience. In sports, this has resulted in growth in behind-the-scenes coverage. For entertainment events this means pre- and post-show programmes and interactive apps. It’s all about engaging with viewers directly, such as through social media, and encouraging them to treat their viewing as community, friends and family events. Ultimately, it’s the calibre of content that will remain most important for the viewer. 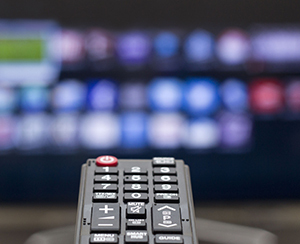 Technology innovation won’t change that, but it can give broadcasters many opportunities.